*Never noticed this, but there's no "Straying from the Party Line" label on posts. I liked the surprise of Snoke's death --I generally liked the fraught power dynamic between Rey, Ren, Snoke and Luke-- but the problem was that once he was dead, it felt like the movie should be over, and it just kept going and going. I think your point about these stories being unfun acts of creative vandalism are pretty accurate. I've been saying for awhile now that it seems like modern filmmakers are embarrassed of the genre stories they grew up with (or never liked them at all), so they have to make them "serious" and get rid of anything that provides enjoyment or catharsis. I think this misses the point that there's nothing wrong with a story being fun. Some stories try too hard in this vein for the "f yeah!" moments, but when those moments aren't earned, they too tend to fall flat. When a story earns its high points and its thrills, it should absolutely be enjoyable. I get tired of being told my tastes are somehow immature for not wanting a Star Wars movie to be the equivalent of Dostoevsky, only written much worse. Of the three points in your post, I only agree with the first one. It is pretty long, and I felt like it should have ended multiple times before it did. The canto bright sequence was pointless for the plot, but not for characters or theme. "It's impossible for me to care about incompetent heroes." I don't see how that is a problem of the film. "No fun": I think there is a place for "serious" genre movies alongside "fun" genre movies (if one wants to use that dichotomy). I did not find this movie boring/dull. "Too disrespectful of the original". I don't know how this one ruined any more happiness than force awakens. In TFA Evil rises again (Empire & Skywalker), (Leia and Han are separated), Han dies, the Jedi are pretty much gone... the only thing TLJ added was Luke's death, (and details on how the Jedi were destroyed). These movies takes place more than thirty years after rotj, changes are going to happen, including negative ones. I honestly would have preferred if none of the old characters were in the new trilogy, it's not their story, and they distract from it more than they add. When they first announced sequels, I thought "Well, that could maybe work", but then they announced that the original cast was coming back, and that they were going to make a new sequel ever other year for the next twenty years, and I quickly realized, "Oh no, that means that they're going to kill the original cast off to make the villains look more evil, so the original trilogy is going to have an unhappy ending now." And indeed that was the case. I don't think the original trilogy needed any sequels, but if you're going to do them, set them 80 years in the future like Star Trek: TNG did. 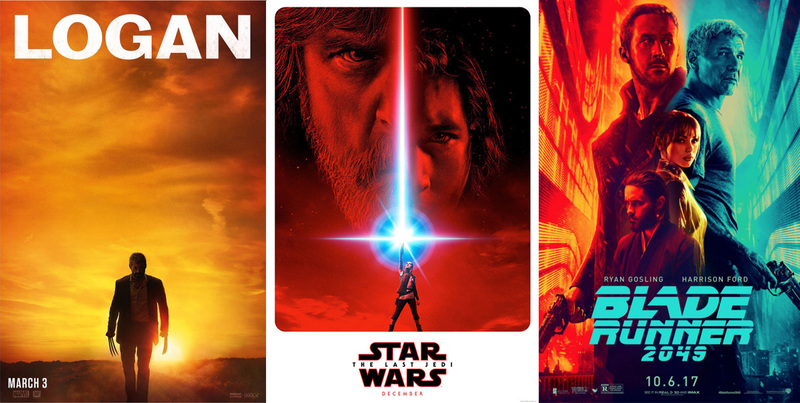 My kids (6 and 3) love the "Star Wars" movies, but they have no idea these movies exist, because I want Star Wars to have a happy ending for them just as long as it had a happy ending for me. Eventually, they will see these movies, but not on my watch. I really enjoyed the new Blade Runner. I think the studio really took a risk in what was essentially a multi-million dollar art house film, and although it looks like that failed commercially, I liked being able to see the story continue in the route of the Director's Cut rather than the original. I don't think if it went the blockbuster route, it wouldn't have had much mainstream attention anyway, since the original doesn't have anywhere near the same fanbase as Star Wars or X-Men. I agree that it was slow, but I think that's part of the appeal, a change from dizzying pace and spectacle. I'm looking forward to the rest of your list, I don't know if you'd count the new series of Twin Peaks as Sight and Sound magazine have, if not I'd still be interested in what you have to say about it.